(Rendering by The Ritchie Group) A rendering of The Ritchie Group's proposed Block 67 development in Salt Lake City, as though looking north along 300 West. Salt Lake City has agreed to help provide millions of dollars in tax money for an underground parking garage as part a massive development of apartment towers, hotels and and office space on downtown’s Block 67, just west of the Salt Palace Convention Center. And the prospect of that public cash has also been a key factor in delicate negotiations aimed at ensuring that what’s left of an old ethnic neighborhood known as Japantown gets a future place in the project’s design. The initial idea, city officials say, was to funnel up to $15 million in state transportation money through Salt Lake County to developers at The Ritchie Group. And then Salt Lake City would pay the county back with future tax revenues from the project and surrounding properties. But that scenario has hit a major obstacle. The same mechanism the city was exploring to fund the underground parking structure — creating a new taxing district — now appears to conflict with a similar plan deployed years ago to pay for the George S. and Dolores Doré Eccles Theater on Main Street. So where does it go from here? The city isn’t entirely sure, but officials say they are still committed to getting that cash to the developer. City leaders heard Tuesday that lawyers are now warning against creating a Block 67 community reinvestment area, a legal tool that essentially lets cities devote a portion of future gains in property tax revenues to improving that area. Danny Walz, chief operating officer for the city’s Redevelopment Agency (RDA), told City Council members Tuesday that a key part of the block bounded by 100 South and 200 South between 200 West and 300 West overlaps with a tax-collecting district created to pay off bonds for the Eccles Theater. Walz said the RDA’s attorneys concluded that carving the whole block into its own tax district could threaten repaying the Eccles debts. Walz confirmed to the RDA board “there are still options for how we structure this for the developer,” though he added those had not been finalized. And another key piece of the city’s involvement with the project is also up in the air, he said. A deal with Salt Lake County covering transfer of the $15 million remains unsigned, Walz said, and with the departure of County Mayor Ben McAdams, elected to Congress in November, questions remain on key details of that interlocal agreement. “We’re still in the process of figuring that out with the county,” he said. 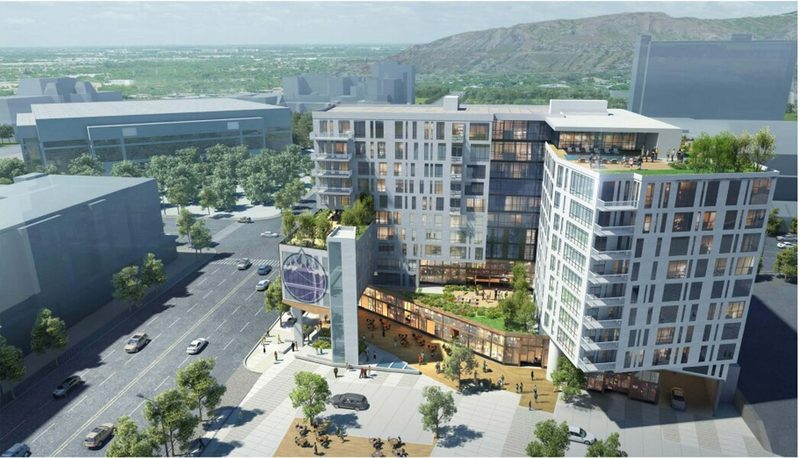 Ryan Ritchie, a leading partner with Utah-based The Ritchie Group, has said the underground parking lot is crucial to the Block 67 project’s overall design and its plans to somehow incorporate Japantown. But the developer told The Salt Lake Tribune that even without a community reinvestment area covering all of Block 67, The Ritchie Group was confident the project would go ahead as planned. Ryan Ritchie said Wednesday he had been assured the company would still receive public funds for the parking garage and that designs for the first of two phases of construction for The West Quarter were not being changed. “We’re still planning to build phase one as is,” said Ritchie, who added that some kind of taxing district remained “critical” to the project’s finances and suggested the city might create a smaller district on just the northern corner of Block 67, outside the taxing portion of the central business district. “I think the city has every intention of creating it. They’ve been very supportive of it,” the developer said. The West Quarter project is among the largest developments now being pursued in the capital city’s downtown, with plans for more than 650 residential dwellings, two hotels, an office tower and a host of shops and eateries along a tree-lined street winding through the block — as well as the underground parking garage with more than 1,000 stalls. With its footprint and the proposed height of its towers, the project is expected to, in effect, push the city’s downtown further westward, with potential to tie the business core more closely with Vivint Smart Home Arena and The Gateway. While proceeding on separate tracks, negotiations on public cash for the parking garage are closely linked with ongoing talks on the future of Japantown, an ethnic enclave that once thrived along 100 South on Block 67’s southern edge. Members of Utah’s Japanese community have raised concerns that The Ritchie Group’s project will overwhelm the Japanese Church of Christ and the Salt Lake Buddhist Temple, the two buildings left in that area from what was once a vibrant strand of shops and gathering places catering to Japanese immigrants. The city, in turn, has sponsored mediation talks between the developer, the Japanese community and other stakeholders in hopes of including some recognition of Japantown’s legacy and heritage in the final project. A new phase of those negotiations was set to begin Wednesday. The City Council has also set aside $100,000 for “place-making” related to Japantown in hopes of fostering a compromise in those talks, and The Ritchie Group has offered to put $1 million toward a Japantown presence as part of The West Quarter. But Ryan Ritchie has said that scenario depends on building the project with the underground parking complex.